When the rock giants Kiss stepped onto the stage for the first time back in 1973, no one (except maybe the band) thought that it would last over 45 years. Kiss are finally closing the last chapter in "Kisstory" with their latest tour named "The End Of The Road." 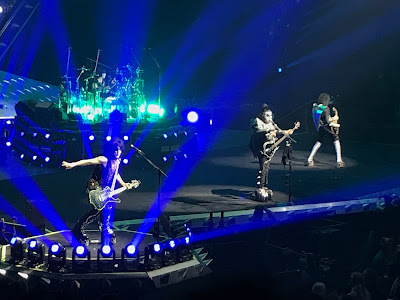 The Mohegan Sun Arena last Saturday night was ground zero for this tour to make its final appearance in Connecticut. Kiss was never the conventional band, as they used explosions and neon lights, before they became the norm at rock concerts. So, Saturday night started out with another choice for an opening act that may have seemed odd. Performance painter David Garibaldi ("America's Got Talent" finalist) got the night rolling with a mix of music with a trio of paintings, depicting Ozzy Osbourse, Jimi Hendrix and of course Kiss. Then is was time for the headliner, as the famous words rang through the speakers "You wanted the best, you got the best! The hottest band in the world, KISS!" The curtain dropped and the band descended from the rafters, as explosions and fireworks lit up the stage. 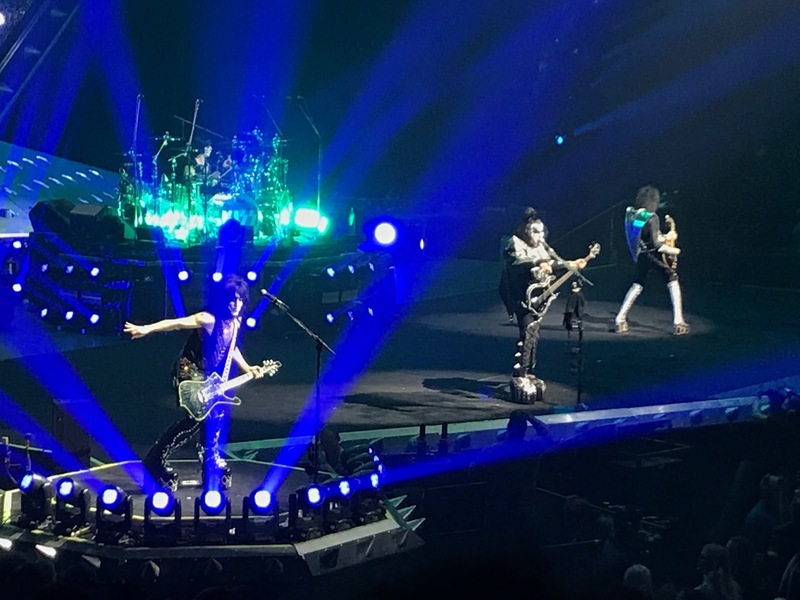 Kiss dove right into a trio of classics with "Detroit Rock City," "Shout It Out Loud" and "Deuce." The dozen or so octagon shaped lighting dishes along with the huge video screen only added to the lasers, fires and explosions that a Kiss concert is known for. Plus, no Kiss concert would be complete without the fire-breathing, blood spurting demon (Gene Simmons) getting the crowd riled up. Simmons and his partner in crime, Paul Stanley (only original members) traded lead vocals, as Kiss ran through a history of songs, including "I Love It Loud," "Heaven's On Fire" and "Lick It Up," which also featured The Who's "Won't Get Fooled Again." Drummer Eric Singer and guitarist Tommy Thayer got their moments in the spotlight with their own extraordinary solos. The night also featured Simmons ascending up to the roof to perform "God Of Thunder," while Stanley's own theatrics of flying over the crowd got a big applause from the fans. 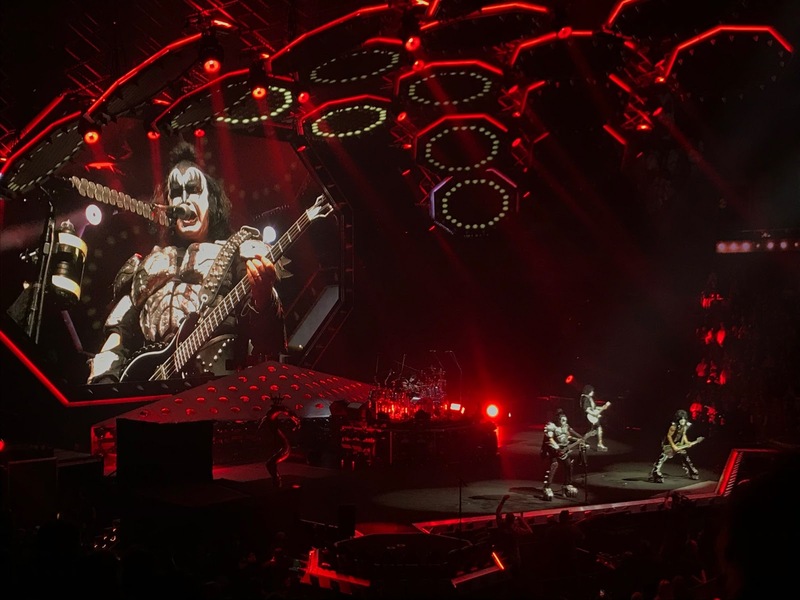 Kiss closed out their main set with one of their oldest songs, "Black Diamond," which was originally released on their debut album, back in 1974. The encore began with Eric Singer rising up through the stage on a white grand piano to sing the famous ballad, "Beth." After a quick bow from the band, the night closed with the pounding rhythm of "Do You Love Me" and the confetti-filled, explosiveness of "Rock And Roll All Nite," as Simmons and Thayer flew over the crowd, bringing the music out to the audience. If this is the final word on Kiss in Connecticut, they certainly left their impression on the packed arena. The fans came out for one reason, to thank a band that has stood the test of time and gave us one amazing soundtrack to our lives.